nanobugs® | Food Safety with Holiday Buffets – Don’t entertain the Nanobugs®! 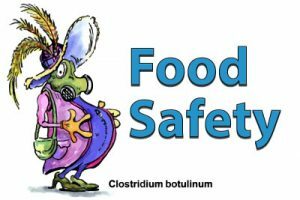 20 Dec Food Safety with Holiday Buffets – Don’t entertain the Nanobugs®! Use shallow serving dishes. Fill them ahead of time and place in the refrigerator. As one is emptied, remove it from the table and replace with a fresh dish pulled directly from the refrigerator. Do not scoop the room temperature remnants from the first dish into the fresh one. It’s all about temperature. Nanobugs® thrive in temperatures of 40 -140 degrees. We call it the Danger Zone. Careful planning is important for proper placement of foods on the table and moving food on and off the table. A food safety-conscious host will keep a mental clock ticking so that foods do not spend more than 2 hours in the danger zone. Warming plates and sterno burners can help keep food above 140 degrees but could add some other risks (electrical cords and open flames in the table). Placing serving dishes on ice can keep cold food appropriately chilled. Human behaviors of guests can sabotage food safety and allow the nanobugs® to access foods and entertain themselves too. Norovirus is often spread by human hands to food and then eaten by the next person. Offer hand hygiene (washing or sanitizer options) but don’t place sanitizers on the food table. Supervise and assist young children older guests so they do not contaminate the food. Have an ample supply of clean plates on the table and encourage guests to use a clean plate for return trips just as restaurants require. Anyone recovering from vomiting and diarrhea is not welcome in the kitchen or helping you serve. Don’t be afraid to establish rules of your kitchen especially for entertaining. Communicate your rules and explain the rationale related to food safety. Reinforce the rules with comments like, “Remember the nanobugs®” Have some fun with it – unite homo sapiens to control the microbes. Changing and shaping human behaviors requires reinforcement and role modeling. Make sure your holiday buffet doesn’t lead to a holiday BARF-fet!